Algal blooms are a toxic danger spreading in waters across the country. How can you avoid them? 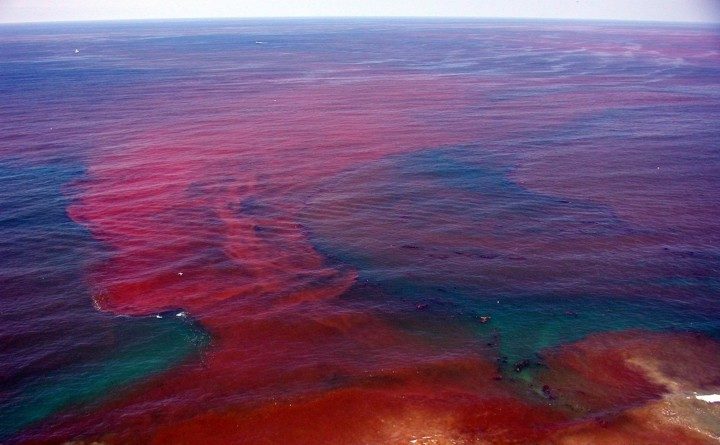 Are algal blooms a symptom of climate change? STATEWIDE — From Fort Lauderdale to the lakes in Minnesota and to our own shores and lakes in California, blue-green algae, a toxic cyanobacteria, lurks. Algae blooms are making headlines across The United States in about every state with standing, fresh or salt water. Blue-green algae, despite its name, are actually not algae at all, strangely enough. The scientific name is cyanobacteria, but because it is aquatic and photosynthetic (uses sunlight to gather nutrients from carbon dioxide and water) it is commonly referred to as algae. Cyanobacteria possess chlorophyll, which is specific to this strain of bacteria, and can also produce oxygen just like other plants. What’s causing a rise in algal blooms? Scientists have theorized climate change and global warming may be having a disadvantageous effect on freshwater lakes and marinas as well as marine environments. One of the major concerns, according to the EPA, was warming water temperatures, which creates the perfect mixture of ingredients for algal blooms to increase growth. Algal blooms, due to its photosynthetic nature, absorb sunlight, making the water warmer and promoting more growth. A few other changes in the water have contributed as well such as changes in salinity (the recent droughts that cause freshwater to become saltier) and a rise in carbon dioxide levels (blue-green algae needs carbon dioxide to survive). Other dilemmas that may contribute to the growth of blue-green algae could be sea level rise, changes in rainfall and coastal upswelling. As the coastal and inland waters change in California, it may be more common to see blue-green algal outbreaks unless further measures are taken. Though blue-green alga does have a place amongst flora and fauna, running into it is more along the lines of walking into a patch of poison ivy or poisonous plant for humans and animals. Algal blooms can cause swimmer’s itch. If the water contaminated with algae toxins is consumed, the liver and nervous system can be affected in animals and humans. Pets are especially susceptible because they tend to come in contact with the algae for a longer period of time if they drink lake water or groom the scum from their fur. Blue-green algae can be harmful to everyone, but it is especially so to dogs and children. Several pet deaths related to blue-green algae have been reported in California this past summer. According to The California Water Quality Monitoring Council, it is important to watch pets and children in the presence of a contaminated area and make sure they do not swim in or ingest the water with scum present. Do not cook with or eat fish or shellfish from a contaminated area and be sure to rinse with clean water after playing or coming in contact with the water. There have been at least 10 reported sightings of algae blooms have been reported since Sept. 11. However, it appeared none of the most recent sightings (taking place within the past few days) had been recorded in Southern California (as of press time). According to My Water Quality, and other sources, algae have the appearance of paint spilled on water. In simple terms, toxic algal blooms look like they are separating from the water and float just on top. It also comes in several colors from green and blue-ish green to pinks and browns. While potentially deadly to animals and humans, scientists at The Australian National University have had a breakthrough study showing blue-green algae could boost growth in foods such as wheat, cowpeas and cassava. Blue-green algae may have its place, but on the water, while boating or swimming, it’s safe to say is serves mostly as a danger and nuisance to humans and pets. My Water Quality operates a harmful algae bloom (HABs) map online at mywaterquality.ca.gov. The map is updated with information provided voluntarily. When coming across a patch of possible unreported harmful algae, call 916-341-5357 or 844-729-6466. Contact can also be made via email at CyanoHAB.Reports@waterboards.ca.gov. actualy, we have seen some algae blooms this year locally, in Channel Islands Harbor, even as May and June weather were a bit cooler than normal. Weather and water temperature warmed up considerably later in the summer, so I guess that doesn’t supprt the global warming/alage link theory so well.